To our neighbours in Queens Head Street, Packington Street, Raleigh Mews & Gough House. Since the issue of our last newsletter Paul Makepeace, Senior Site Manager has joined the Faithdean Plc site team his contact details are noted below should you wish to contact him. As members of the Considerate Constructors Scheme we are taking all reasonable precautions to mitigate the effect of the works on the building’s surrounding neighbours, however, due to the nature of the works occasionally some inconvenience will be experienced. Our first Considerate Constructors audit for our project was undertaken on the 2nd May 2017, and we will publish our score for this in the next issue of the newsletter. We would like to take this opportunity to thank you for your understanding and patience during the construction works and apologise for any inconvenience that may be experienced. To supplement the monthly newsletter we have now installed Project Notice Boards on Queens Head Street, Packington Street and Essex Road. These will be updated on daily basis if required to convey important activities to the local community along with contact details of the site team, and continue to display the two week look ahead and noisy work schedules. Essex Road, the scaffold and hoarding is now complete, graphics will be applied to the Essex road and Packington street elevations advertising the project in the near future. The Packington Street roof has now been removed the remaining walls are secured temporary structures. Work has commenced on the new steel frame in the basement of Packington Street , you may well have seen the mobile crane 26th April 2017, a partial road closure was in place Packington Street whilst the crane was working over a 2 day period. The structural steel from ground floor to the roof is scheduled to commence 9th May 2017 and will take 5 weeks to complete during which time the crane will be in place every day. Traffic Marshalls will be on hand to assist with the safe movement of traffic and pedestrian management during this period. Works to the Queen Head Street have progressed well with the underpinning of adjoining buildings remains on programme to complete in May. We will endeavour to give you as much notice as possible and provide you with relevant details regarding all potentially disruptive works we are due to commence. The project as a whole is due to be completed in February 2018. Weekdays the site opens at 8am and closes at 5pm. Saturdays if required the site opens at 8am and closes at 1pm. Waste away and general deliveries, take place between 10am and 3:30pm. Scaffolding deliveries and cranes will be parked in Packington Street between 8am and 5pm. On every alternate Thursday, 4 and 18 May 2017 the Project Team will be available at 160 Packington Street in the Site Office between 16:30 and 17:00 to answer any question that neighbours may have regarding the project. Please feel free to come along. However should you wish to make an appointment, contact Richard Squires Project Manager, his contact details are noted below should you wish to contact him. 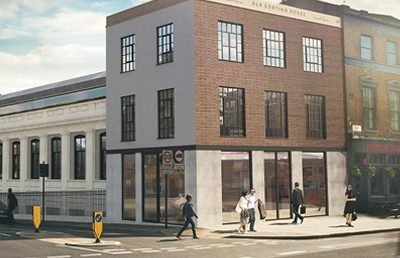 Refurbishment of 160 & 162 Packington Street, 46 Essex Road along with a new build extension situated off of Queens Head Street. All such work is undertaken in consultation with the local authority, Martins Properties and neighbouring tenants plus we will provide an onsite liaison person (details below). The site is fully running now with works being undertaken to both the new building on Queens Head Street and internally to 162 Packington Street. Current construction activities during May include. Structural foundation work and excavations to basement level on Queens Head Streel. Temporary propping to the Essex Road Façade. Faithdean PLC take the health & Safety of all staff, operatives and the general public very seriously and are proud to be associated with the Considerate Constructors Scheme, improving the image of Construction. To improve site safety and security, CCTV is now in operation around the site. We have now had eight internal Health & Safety inspections carried out with no incidents to report. If you have any concerns please contact our site management team, we are based in the site office in 160 Packington Street. Since the approval of an application for variations to the original planning permission by Islington Council on 14th September 2016, you may be aware that Martins have made further planning applications in relation to the site. These applications are variations on points of detail and do not materially alter the scheme. the various facing materials to be used on the building along with a Green Procurement Plan and internal sound insulation details (submitted 15/02/16). This application is awaiting validation. We will continue to update you in this newsletter as further applications are submitted.